I first met her in the year of 1998, that was also the first time that I got really involved in any Church activity. She's the one who never fails to smile to everybody. She's a sister for all. The best friend for some. Always ready with advices. You can call her anytime of the day just to cry. I could not remember how many times I cried on her shoulder. She never fails to understand. And no matter how bad you feel, everything will be lighter in the end, after speaking with her. She's the sister I never had. Ever since I knew her, I knew she's special. She had heart by-pass long ago. You can see the scar by her chest. Even if her heart sometimes fails on her, she never fails to LOVE. She loves us. We are all her siblings. Their house is always open for us. Morning till night, we can run to her for advices, we can even sleep there. She's also gifted with a gift of healing, she can remove the pains and ailing with just a touch of her caring hands. Sadly, she cannot heal herself. And today, the news came out. She's left our world. Her heart failed on her for the nth time, this time, the help for her was late. She joined our Creator and ended all her pains. It saddened me. Teatrong Kumot lost a great adviser. JMY lost a great leader. And we lost a great sister. I never expected that parting would be that fast for us. The last time we talked was on the evening of Holy Thursday, she was still happy then. She said she's happy to see me so happy now, that gone are the days when all she could see on me are tears. I told her, yes, I am very much happy and blessed, for I finally found my happiness. And she even said she too, do found her happiness. She even mentioned of plans of wedding. That was the last talk we had. After that, I failed on communicating with her. As I write this down, I cannot help not to cry. It seems like something was taken out of me. Seems like my life is not that complete anymore. It feels like a part of me had left, and I knew, it would never come back again. A part of my smile was taken away. A very good friend and sister was taken away from me. But I know, I should be happy as well. For I know she's reunited with our Creator. The only Guy she had loved and served all her 29 years of existence. That despite all the trials she went through, she remained clinging by the arms of Jesus, and it's the greatest lesson I've learned from her: NO MATTER HOW DIFFICULT LIFE MAYBE, CRY IF YOU MAY, BUT NEVER LET GO OF HIS HAND. SOMEWHERE, HE CREATED SOMEONE TO MAKE THOSE TEARS GONE. SOMEONE OUT THERE IS MEANT TO MAKE YOU HAPPY AND MAKE THE BURDEN LIGHTER. Thank you, Ate Judee for the gift of friendship and love. Thank you for always being there for us. Thank you for listening and crying with me. Thank you for saying how stupid we may seem or how wrong we are on what we're doing. Thank you for teaching us the way to Christ. Thank you for teaching us to remain faithful despite all the trials. Thank you for treating me, Nerai, Major, Icoy, Tano and the rest of the Teatrong Kumot as your brothers and sisters. our times at Teatro and JMY were truly the golden years of the organization. Thank you for bringing the smile and the light atmosphere to the group. You will forever be missed, I'm sure of that. But rest assured, no matter where you are, you will forever be in our hearts. You will always be the one and only Ate Judee, our confidante, sister and best friend. 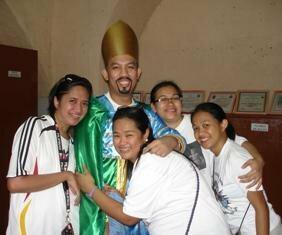 This photo was, I guess, our last photo together with Kuya Onad, Ate Anna and Phia taken last year before the Cenakulo. Those China-eyes, and that sweet smile, I'll surely miss. Even now, I am missing her already. Credits for the photo to Phia. Philippine Fruit You'd Surely LOVE!